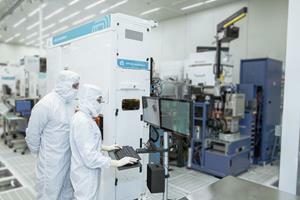 SANTA CLARA, Calif., Nov. 15, 2018 (GLOBE NEWSWIRE) -- Applied Materials, Inc. today announced plans for the Materials Engineering Technology Accelerator (META Center), a major expansion of the company’s R&D capabilities aimed at creating new ways for Applied and its customers to drive innovation as classic Moore’s Law scaling becomes more challenging. The primary goal of the META Center is to speed customer availability of new chipmaking materials and process technologies that enable breakthroughs in semiconductor performance, power and cost. The new center will complement and extend the capabilities of Applied’s Maydan Technology Center in Silicon Valley. The META Center will be a hub for innovation, delivering on a call to action by Applied CEO Gary Dickerson for increased collaboration and speed across the technology ecosystem. Scheduled to open in 2019, the META Center will be a first-of-its kind facility, spanning 24,000 square feet of cleanroom. It will be furnished with a broad suite of Applied’s most advanced process systems along with complementary technologies needed for new chip materials and structures to be piloted for high-volume production at customer sites. To be located at the State University of New York Polytechnic Institute (SUNY Poly) campus in Albany, New York, the META Center will be created under agreements to be entered into with New York State, The Research Foundation for The State University of New York and SUNY Poly, that have been approved by the Empire State Development Board of Directors and are subject to further approval by The New York State Public Authorities Control Board. This press release contains forward-looking statements, including but not limited to those regarding plans and expectations for the proposed research and development facility, industry outlook and technology requirements, the development of new materials and technologies, and other statements that are not historical facts. These statements and their underlying assumptions are subject to risks and uncertainties and are not guarantees of future performance. Factors that could cause actual results to differ materially from those expressed or implied by such statements include, without limitation: the ability of the parties to consummate the agreements under which the facility will be created; the ability to secure regulatory and other approvals in a timely manner or at all; the demand for semiconductors and customers’ technology requirements; our ability to develop new and innovative technologies; our ability to obtain and protect intellectual property rights in key technologies; our ability to achieve the operational objectives of the proposed facility; and other risks and uncertainties described in our SEC filings, including our most recent Forms 10-Q and 8-K. All forward-looking statements are based on management’s current estimates, projections and assumptions, and we assume no obligation to update them.